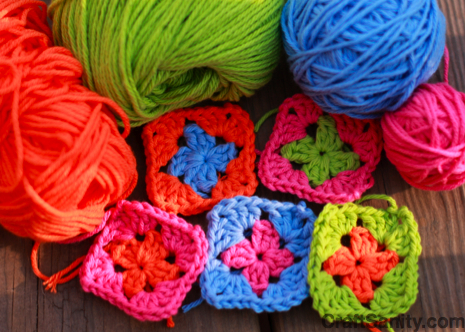 Some of my earliest craft memories involve me sitting on a little chair in my Great Grandma’s kitchen stitching granny squares with the scrap yarn I collected from the elder crafters who gathered there weekly for lively craft sessions. I was five when I started making granny squares and I loved them then, but I think it’s quite possible that I love making granny squares even more now. I love selecting colors and then stitching fast to find out out how the square will turn and then arranging and rearranging the squares on the floor to achieve the most pleasing layout. I love the fond childhood memories that surface every time I see one. These simple little squares make me feel very happy, and well, I love that, too. I’ve been so inspired by the other granny square makers I’ve found on the web (Sarah London and Pip of Meet Me At Mikes, that I grabbed some cotton from stash and my G hook and started stitching. 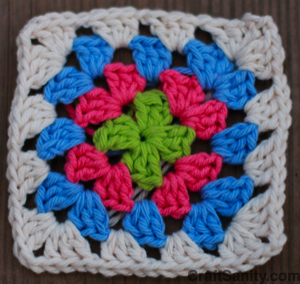 Granny squares are wonderful because they are essentially mini color studies that allow you to test colors together and experiment with no major investment of time or supplies. These squares also inspire creative stash busting. I’m not buying any new yarn for this batch of grannies until all the cotton I have is used up. This rule will force me to mix colors I probably wouldn’t if I was free to select new yarn. So I think this will be an interesting experience. Pip is making a Granny a day and inviting others to take up the challenge. I’m tempted to join in. Check out the awesome Flickr group and you’ll probably want to join in, too. I’m not sure that I can commit to a Granny a day, but here’s the granny I made today. It’s Granny #1. I’m thinking about putting up a new inspiration wire on the main floor of my house and hanging up all the granny squares so I can see them every day as the collection grows and feel like I’m really making progress. Happy stitching! P.S. The winners of the “Knit & Crochet Today” DVD set and “Made From Scratch” book will be posted tomorrow. There’s still a time to enter to win the book. The deadline is today, so go enter if you’re interested.